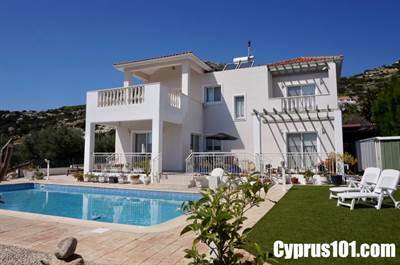 This stunning 3 bedroom detached home is nicely tucked away in a quiet and established residential area of Lower Peyia Paphos. Situated on a 704 sqm plot, the property is well maintained with good quality finishes and many extras. A gated driveway leads to a large parking area to the side of the property. A car port provides covered parking and from here there is easy practical access directly into the kitchen. An entrance porch with decorative archway leads to the living accommodation which features an open plan living room with comfortable lounge, formal dining area and fully fitted kitchen. A granite topped breakfast bar nicely separates the kitchen from the living space and tall built-in cupboards to the side provide very useful, additional storage space. Completing the ground floor accommodation is a double size bedroom with fitted wardrobes and en-suite shower facilities, which is currently being utilised as a study room. A marble staircase leads up to a separate family size bathroom and two further double bedrooms, one with easy direct access to a spacious, private veranda with plenty of space for relaxing and sunbathing. From here you can enjoy the superb coastal views and stunning vistas of the surrounding hills and countryside. The low maintenance outdoor leisure space is beautifully designed with a large crystal clear swimming pool and surrounding sunbathing terrace being a spectacular central focal point. A raised full width, partially covered outdoor terrace is an ideal spot for outdoor dining and relaxing and the fully enclosed mature garden features a large variety of trees and shrubs offering colour, privacy and delightful fragrance. This property certainly has lots to offer and is highly suitable as both a permanent residence or holiday home. A selection of furniture can be included if required and there are full title deeds.